Pirkanmaa Triennal is a gathering of contemporary art from artists in Pirkanmaa region held every three years. Tampere Artists' Association has been organizing the event since 2000 in cooperation with the art museums in Tampere and Arts Council of Pirkanmaa. 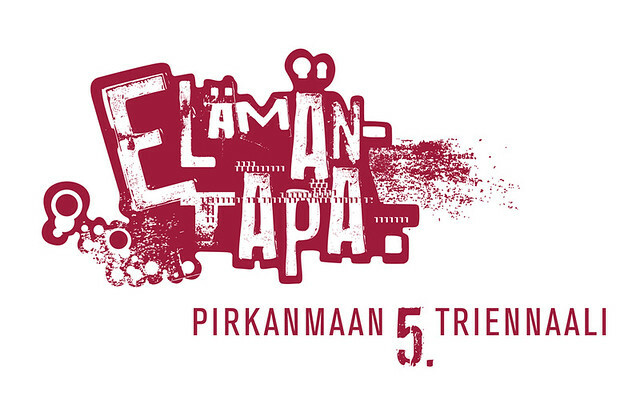 The theme of the 5th Pirkanmaa Triennal is Way of Life. 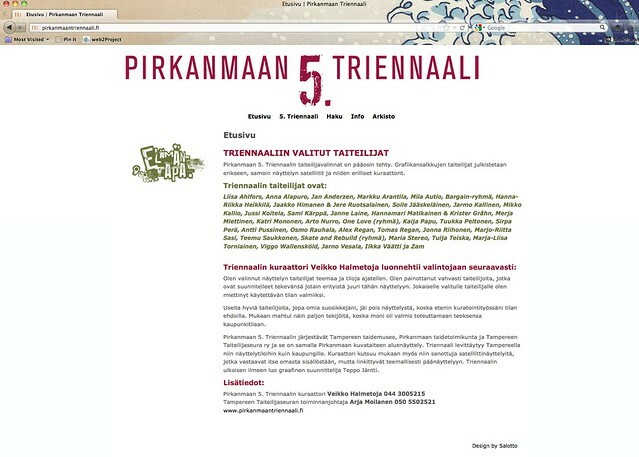 This regional exhibition of art in Pirkanmaa features artists in the region from a new viewpoint in summer 2012. There are young artists in the beginning of their career as well as older, more experienced artists. The artists have been invited to the exhibition by Veikko Halmetoja, an arts critic of Helsingin Sanomat, the biggest newspaper in Finland. Halmetoja (born in 1977) has previously worked as an executive manager for Mänttä Art Festival and as an arts critic for the regional newspaper Aamulehti. The Triennal artists are: Liisa Ahlfors, Anna Alapuro, Jan Anderzen, Markku Arantila, Miia Autio, Bargain-ryhmä, Hanna-Riikka Heikkilä, Jaakko Himanen & Jere Ruotsalainen, Soile Jääskeläinen, Jarmo Kallinen, Mikko Kallio, Jussi Koitela, Sami Kärppä, Janne Laine, Hannamari Matikainen & Krister Gråhn, Merja Miettinen, Katri Mononen, Arto Nurro, One Love (a group), Kaija Papu, Tuukka Peltonen, Sirpa Perä, Antti Pussinen, Osmo Rauhala, Alex Regan, Tomas Regan, Jonna Riihonen, Marjo-Riitta Sasi, Teemu Saukkonen, Skate and Rebuild (a group), Maria Stereo, Tuija Teiska, Marja-Liisa Torniainen, Viggo Wallensköld, Jarno Vesala, Ilkka Väätti, and Zam. The Triennal will be held in fine arts exhibition spaces as well as in other spaces all over Tampere. The curator also invites so called satellite exhibitions to join the event. They are responsible for their own content but thematically linked to the main exhibition. 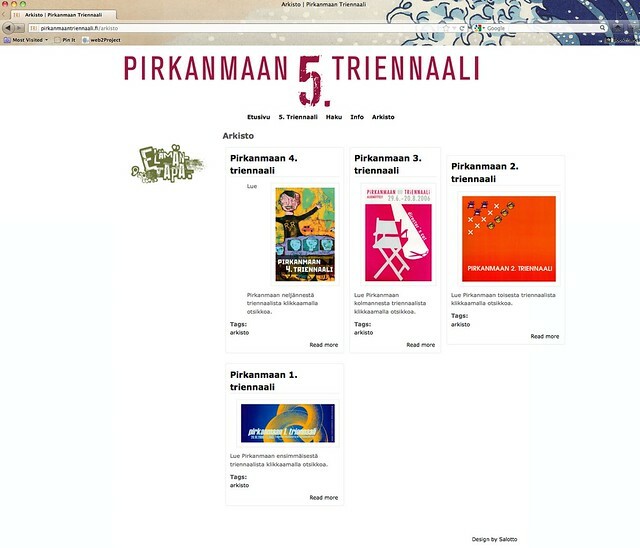 Tampere Artists' Association contacted Salotto last autumn and requested a quotation for the Triennal website. The visual image for the Triennal was created by graphic designer Teppo Jäntti. • and subpages: Curator, Exhibition Sites, Artists, and Satellites. • The first page should have a changing image gallery for the exhibition works in the spring. • An encrypted Media page, so the media would get passwords to access the high-resolution photos of the works and additional information. Salotto estimated that creating and installing the website would take about 16 to 20 hours but the budget for the project allowed only a half of the time. So we reduced the time and costs from training, instructions and update help. Fortunately Drupal is an easy-to-use publishing platform, so with an one-hour training the main user, who just had experience in writing a blog, learned to add content to the website. Just few emails, and the main user was maintaining the website alone. During the spring the website will be filled with information, images, videos, maps and texts. If they manage to get additional funding they will also develop the visual image with Salotto.